Today's question is from Bart from Amsterdam, the Netherlands. Bart ask: "How can you do some quick visual problem-solving? Is there a shortcut or do you always need to follow a complex checklist and create gigantic visualizations?" Well Bart, good question! In this blog I will answer your question by showing a limited checklist which we call for now: The Quick Problem Solving Checklist. In fact what I am doing is using Dragon1 Open EA Method as a cookbook with ingredients and create a new recipe (checklist) hitting the road running. What's the problem, in what situation? When you as architect want to do some Visual Problem Solving, you can do it very quickly. You just have to follow the steps in the next checklist. And when you want to do problem solving you know there are three things: a situation, a problem and a solution. In all cases it is always most important to first define the problem in all its aspects before jumping into conclusions and solutions. In many projects the main problem is that the chosen solution is unclear. So what we really do first is write down the situation where the problem occurs and define various words (nouns) we use in this description. And then: we search for a picture showing with one blink of the eye the situation where the problem occurs. In the image you see a picture of the situation: a customer in a supermarket wanting to buy goods. And the problem in that same picture is immediately clear: there are no goods available at the right time, making the customer unhappy and disappointed. Important here is that this picture of the woman shopping contains the concepts: on site shopping (1) in a supermarket (2). Also some elements of these concepts are shown: customer, cart, shelves (status: mostly empty) and some leftover goods. Make this a practice when you search for pictures: focus on the concepts and elements you want it to show. First name and define concepts and elements and then search on the web or in the companies photo database for a picture using these words. 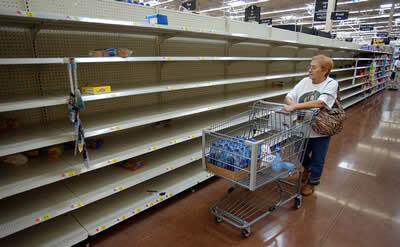 For instance "Customer is shopping in a supermarket and the shelves are empty." Why, you might say, is it so important to state and visualize the situation with the problem? Well, if you think of a solution for a problem, it might not cover or work in all situations. History shows that. What's the Solution for what Strategy? There are many, many solutions to solve a problem. But what is the most wise solution is mostly dictated by the companies' strategy. Without looking at the strategy before, you know your (obvious) solution leads to sub optimalization. An important step in finding solutions is knowing why the problem occurs and when it occurs. And as architect very intriguing is: are there other areas or sciences where the same type of problem occurs and where do they have already found a reusable type of solution? In the image below you see three types of solutions that everyone is familiar with, so acceptance for one off the solutions should be doable to get. You see an image showing a problematic situation and three reasonable solutions to deal with the problem in various ways. What the best solution is becomes clear when we fill in the formula that is presented in the table. Tip: Try to find three solutions that are somewhat spread: low impact (improvement), medium impact (a big change) and high impact (a revolution/fundamental change). Now without having to make your eyes tired by reading text, now in one blink it immediately becomes clear in the image what the problem is and what possible solutions there are to solve the problem. This way of visual problem solving is so much more effective than using text. Seeing is believing. Step 1: Name and define a problematic situation, the concepts related (use literature referral) and the used principles (write them down) that tell of show the problem directly or indirectly. Step 2: Find an image that shows a situation with the concepts and key elements of the concepts, so people see and recgonize the problem and situation at once. Step 3: Think of, using the defined strategy, three concepts and their principles (refer to literature) implementable in the organization that solve the problem in their specific way. Step 4: Find images that show key elements of the solution concepts in a situation that people can understand without being an expert that the solution takes away the problem. Step 5: Name benefits and concerns per concept to have the owner/client take a decision using the visualization. Below is a table that I always create when executing the checklist. I just first fill in the 'answers'. And next go look for the pictures. The pictures when presented to the owner/client asking a solution for the problem can give feedback on how well the pictures match what he or she was thinking of. 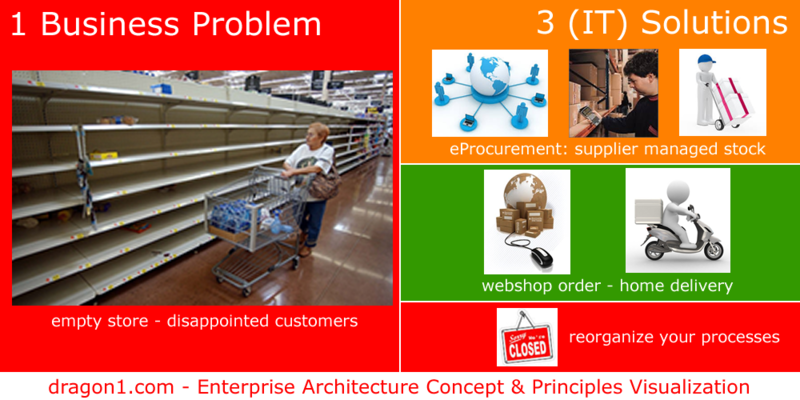 Problematic situation: The suppliers do not deliver anymore on time causing the shelves in the store to be empty at times when customers want to buy goods. More and more clients are going to the supermarket next door never to return. This causes lower revenues, slows down the product cycle. The circle has become vicious. A reason the amount of stock items is not correct is because of a lack of knowledge about this topic within the organization. Concept: Stock Management & Control, knowledge, expertise, experience, … Failing principle of stock management and control: Make sure that the amount of stock available is in line with revenue and stock cycle. eProcurement is an IT concept in which suppliers keep track of the amount of stock items remote via the internet and do proactive delivery. They use knowledge on product stock cycles for the optimum stock amount for certain items. Start selling products via the internet surpassing the problem of Supermarket Stock Management & Control. (Temporary) Solution Concept 3: Take the time to redesign the processes in the organization and increase the knowledge needed (via training and hiring new people). Well, that is about it for now. Thank you for reading my blog and enjoy your visual problem solving!